I am still looking for a colourful cardigan. I have months left before my final SWAP collection, but I have been thinking about how to create a colourful cardigan and have been given some advice by my knitting friend Galina. She suggested I buy a nice cashmere cardigan and embroider on it. She sent me some Debbie Bliss pictures as inspiration. I always like to see colour on a black background as it can really make the colours sing out, but I while I might choose charcoal I was thinking of a white cardigan which has a similar effect. Here is a second Debbie Bliss jumper with knitted patten plus embroidery. Another inspirational picture I found is from the Matthew Williamson collection. This uses beads and bobbles as well as couching. Both the Debbie Bliss and the Williamson item are very folksy, which is nice. But I preferred the work of a young London designer Laura Helen Searle, which is beautiful, edgy, challenging and quite sensational. If I cannot find a cardigan in the colours I am seeking then I am going to have a go at embroidering on wool. I am thinking of trying to create this cardigan as my reversible garment as the reversible skirt is probably going to have to make way for the Squiggle trousers. I have bought two jerseys, one in grey and one in off white. I am thinking of making a cardigan from them, and then embroidering some colour on to it. I would have to cut the jumper down the CF, stabilise it in some way (ribbon? ), create a set of buttons and button holes, or maybe press studs so it is reversible. I think this is what is known as steeking (text abreviated from Wikipedia). After completing a tube, a straight line is cut along the center of a column of stitches, in order to make room for an opening. The steek itself is a bridge of extra stitches, in which the cut is made, and is usually 6-10 stitches wide. This technique was developed by the knitters of the Shetland archipelago and is particularly associated with Fair Isle sweaters. Before the steek is cut, the edges are tacked down on the wrong side of the fabric in order to create a neat finishing, or the adjacent stitches are sewn or crocheted together to prevent unraveling. 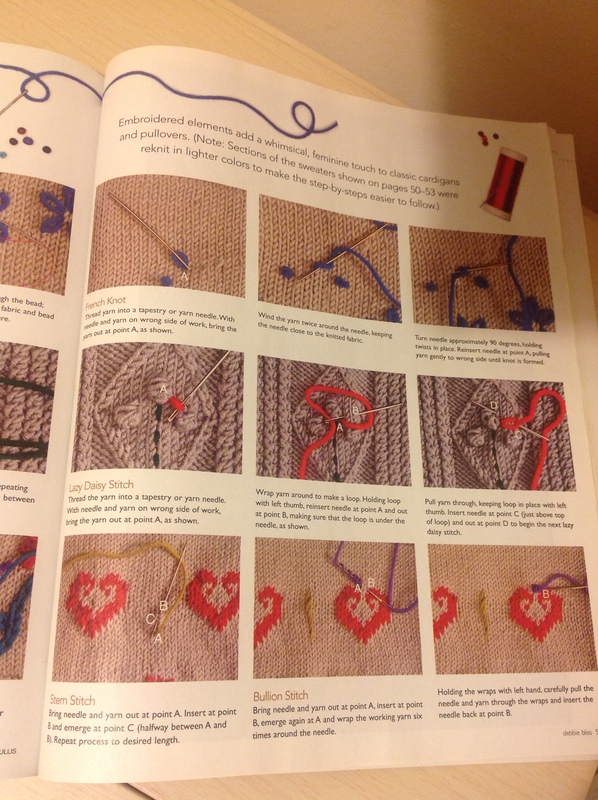 The stitches can also be picked up and knit from, for example, to create a sleeve. Steeks can be used for front openings (such as on a cardigan). In general, there is little risk of unravelling with a steek cut if the sewn or crocheted line has been done with wool yarn that is not superwash. In addition, the sides of the steek can be reinforced by crocheting or sewing. If I make the two jumpers into one cardigan I could then embroider on the two layers so that the back is as nice as the front. Or embroider each separately and then join them (wrong sides) together. Just a thought at the moment. Has anyone every tried steeking or embroidering or both? How do you address the stretch on the button hole edge, in making a cardigan from a jumper? When you embroider how do you stop it bunching up and tightening the knitwear, loosing its essential jersey-ness? I have knit many a cardigan in tube form and then steeked. Edges, of course, must be stabilized and cut edges and seams covered. I have used ribbons, made and used bias strips, and knit and used thin strips out of a of very lightweight wool. These ribbons and strips are carefully sewn in. I also add reinforcement under the buttons (e.g., ribbon). You may find it useful to read Alice Starmore’s explanations of steeking. Hurray! Within minutes of posting my question I have an answer… Karen, thank you. I am keen to try this and will now look out Alice Starmore. My mother was brilliant at doing this. 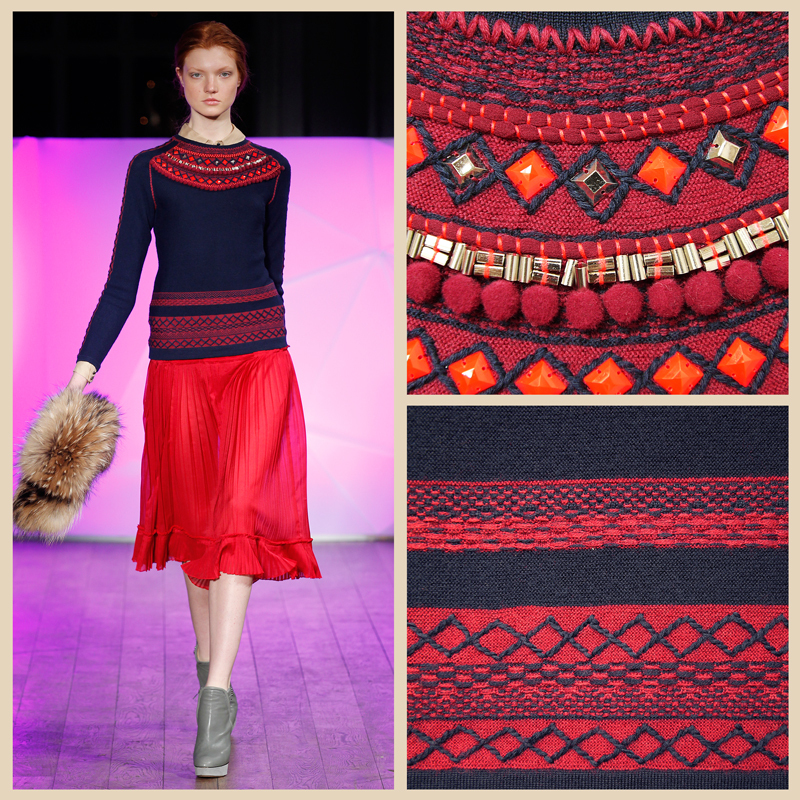 She used to knit traditional Tyrol jumpers and cardi’s and then cover them with embroidery. The trick is keeping the tension. I remember she used to keep the garment taute by putting a cushion inside and sewing it on her lap. It worked so much so that I still have two cardi’s that she made 30 years ago. I have seen a lot of embroidery on sweaters over the years and as you I mentioned last week have thought of doing something van Gogh- ish almond blossoms with a top, but haven’t done it yet! I am especially drawn to the Laura Helen Searle pullover on left. Very cool. I purchased several beige/cream colored men’s v-neck cashmere sweaters from E-bay (each less than $20) with the intention of dyeing them with ecoprints. However, I got cold before I got to dyeing. I steeked one of the sweaters and wore it (around the house) all winter as a cardigan. The edges were unfinished, and there was no problem with fraying or stretching. I thought that was really interesting.